Bringing the masses together to dance, listen, and indulge in the wonders of steampunk music and culture. Over the past two years, Steampunk-Music.com has interviewed many musicians, including solo artists, dynamic duos, and full bands. Recently, I realized we hadn't given due service to another important group of individuals: the DJs and promoters who put the music out there and present the many wonderful steampunk bands out there with new audiences to enchant. Word of mouth is vital to the success of the independent bands that make up the majority of steampunk music, and these folks wield some very big megaphones. Many of the big names in steampunk music wouldn't be nearly as successful without DJs and promoters putting their music out in front of the masses. 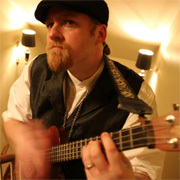 On this occasion, we're focusing on an individual that's helped introduce new audiences to steampunk, both as a whole culture and a form of musical expression: DJ Doctor Quartermain, popularly known as Doctor Q. He and his comrades at the Artifice Club have done great things for the steampunk community and its music scene. Read on to see what they've accomplished, and what they've got in store for the future. SP-M: Doctor Q, I suspect you may have invented time travel. After all, you're a well-known DJ, Dragon Con Alternate History Track director, Executive Director of The Artifice Club, host of the Ratchet Retrocast, and event promoter. How do you keep your head on straight without bending the space-time continuum to your whims? I believe another Doctor can be credited for time travel. I'm just a guy privileged to lend a hand where I can. As the Executive Director of The Artifice Club, our vintage arts nonprofit is dedicated to the support and promotion of all forms of artistic expression that honor the contributions of the past with the imagination of the present. As such, in that role I support any project I can. The largest of which is my team and I running the Alternate History Track at Dragon Con, but we do a lot of other things big and small all over the US. The DJ gig began as an excuse to organize some local steampunk parties, and it sort of grew from there. Now I get to have fun once a month in town via the Speakeasy Electro Swing Atlanta events, and even that is a bit of vintage-inspired fun, though it's really a personal pet project. As for the podcast, while I credit the creation of that show entirely to John Strangeway (aka Steampunk Boba Fett), it's a fun time to sit and chat with friends. While it may seem like something to tack on a resume, it's really just an excuse to make sure I spend time with good people and engage in interesting conversations. Most of my life these days is pretty public, so I guess that's where all my time and spare money goes. SP-M: The Dragon Con Alternate History Track is arguably the largest fan track at the largest pop culture/media convention the east side of the Mississippi, with an estimated 62,000 attendees this year. How early does the planning start, and what's the secret to making it all come together? Well, first of all Dragon Con is THE largest fan-run convention in the world. While other shows are excellent, they are run by companies and gain corporate profits, Dragon Con has been and will always be by fans for fans. My track is the largest fan track, yes, but not the largest track. Those would be the media tracks, as they have big media guests to deal with. That said, we're a pretty big part of the show, which I am very proud to be a part of. Planning for my team is year round honestly. We meet and have a wrap-up 3-4 weeks after the Con, then get a post-show report compiled afterwards, followed by the beginning of planning en force starting in January. There really isn't a secret to it, the key is having a fantastic team. Believe it or not, most years I really don't do much. Dragon Con programming is a cakewalk compared to hosting, running, and producing your own large scale events, albeit for a much smaller audience. The programming team, guest committee, and entire volunteer organization really share the load and make the Con possible. Can't say enough good things about the folks on my track. They're gems. SP-M: The Alternate History track has grown so much since it launched in 2009 inside a tiny room in the belly of Dragon Con's Hyatt hotel. Steampunk itself has taken off in a similar fashion. It's everywhere. To what do you attribute that exponential growth spurt? A number of factors actually. The growth of our ability to share our work over the internet and social media for one. The nature of steampunk being both a lose aesthetic structure while at the same time be open for individuality and all forms of artistic expression--be it books, music, costumes, etc.--really is what I think attracts more than anything. But there are so many entry points into steampunk, none of which come from the traditional subculture points of either music scene or media property, that it's pretty easy to see why it's such a prevalent force at Dragon Con (and really any gathering of geeks and fun folks to be honest). SP-M: For someone just getting into steampunk, what are the "can't miss" events at this year's Dragon Con that will show them exactly what it's about? OK. I get asked this a lot. I've got it narrowed down for the two main types of people who come to Conventions. The first type are those who come for the content (panels, guest autographs, workshops, etc. ), and for those the must see events would be the Dragon Con Parade for sure, as well as The Masters of Alternate History Panel with the genre's founders Harry Turtledove, SM Stirling, and James Blaylock. We have so many other amazing panels I can't even begin to pick a favorite, but there's bound to be more than one or two to pique your fancy. I would also suggest making sure to hit up the Art Show as well as the Comics & Pop Art Room for sure. The second type of con-goers are those there for the culture (events, nightlife, parties, music, etc. ), and that's my speciality. We literally have cultural highlights running Thursday through Monday. From the Aether Lounge pre-Con mix and mingle, Friday's Clockwork Cabaret Listening Party featuring a TON of bands on your website by the way, Saturday's Airship Races, Clockwork Carnival, AND Cogs & Cocktails, Sunday's Tea Dueling Tournament and Photo Shoot pre-party, to Monday's RetroCast Round Up summary, you really can't miss. And for ALL types--we have the Museum of Alternate History open all weekend full of fantastic displays of wondrous mechanisms, all culminating in the Artifice Club's annual bash--The Mechanical Masquerade on Sunday night. This year is themed Atlantis, and it'll be enchantment 20,000 leagues under the sea. Featuring the Nathaniel Johnstone Band (and other surprise guests during that time), DJs Emmett Davenport and Lady Attercop of Clockwork Cabaret, and yours truly all taking turns on the turntables. Come in costume and mask or come as you are, we would love to see you there. SP-M: Your non-profit organization the Artifice Club is "dedicated to the appreciation and participation in all vintage visual and performing arts." How do you go about accomplishing this important mission? Great question. Well, we recently met this Spring and laid out a charter and refined our mission statement. Our first primary goal is to raise enough funds to build a resource website for artists and appreciators of art to meet. It will be part portal, part vintage LinkedIn, but it will need a substantial bit of revenue to get up off the ground and we're just getting started. From there, we also plan to lend support either in small contributions or via fiscal sponsorship to any event producers who share the love for all things vintage. In addition, we will be working with other events both in Atlanta and beyond to incorporate vintage arts and steampunk elements to their shows on request. An excellent recent example of this was our sponsored production of The Steampunk Empire Symposium's main Saturday night party this year--The Imperial Officer's Ball (and Rebel Steerage Party). We also sell merchandise to raise funds (such as T-Shirts, CD compilations, etc.) and accept donations on our current website. All proceeds go to helping us really get a solid foundation to provide a resource to all. SP-M: What has been your favorite Artifice Club event to date? Other than our flagship Mechanical Masquerades? Because bringing the first show series we've done since back in 2010 to Dragon Con was a real proud moment. However, my favorite show I've personally produced to date has to be the Grimm Gear Gala. Our storybook steampunk themed bash featured Miss Mousie and the Rigamarole (of Hellblinki fame), Fable Cry, puppetry, an open bar, and catered cuisine. It was the most posh event I've ever put on, and the attendees of the affair blew me away with their costumes. The winners of the costume contest were well deserved as they really went all out. It was just perfect, and it seemed others agreed as it won the Steampunk Chronicle's Readers Choice award for best event (non-convention) this year. 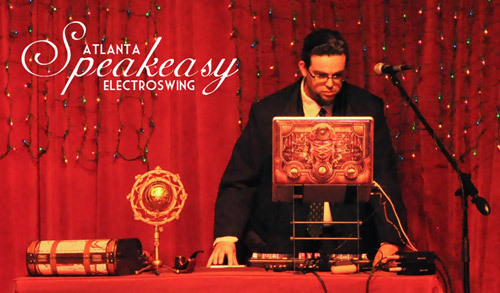 Doctor Q is also resident DJ of Speakeasy Electro Swing Atlanta. SP-M: People don't usually just wake up one day and suddenly declare," I am Steampunk!" Most arrive at it gradually, through music, or fashion, or asking "what if" questions about history. How did your journey to steampunk begin? Oddly enough, burlesque. Like many folks, I loved this stuff before I knew there was a word for it. And back in 2008 the lovely Talloolah Love wanted to work on a clockwork doll number and I helped search around for some music, I found Abney Park's Herr Drosselmeyer's Doll and gave it to her to remix. Which she agreed only if I got on stage with her in costume to wind her up. So that was my first costume. Moments before getting on stage, the MC asked for my name and since I've always gone by Q we just added a Doctor to the front of it and it stuck. SP-M: Many steampunk costumes are based off actual historical figures or fictional characters, such as Iron Man or your own steampunk Captain Marvel. If you could bring forward in time one significant Victorian-era individual, who would it be? Hmm. I'd be hard pressed to choose between Ada Lovelace, Oscar Wilde, or Mark Twain (Samuel Clemens). All three of which I feel had remarkable wit and intellect and all three were well ahead of their time and would have been much more at home in a more modern setting than in the repressed era of their day. SP-M: There's always been this debate about what is--or what isn't--steampunk music. There's an entire page on our site with possible answers from a variety of musicians. However, as someone who's surrounded by and presents steampunk music to the public at large--without actually being a steampunk musician himself (as far as I know)--how would you define it? The short version is steampunk music is anything a steampunk likes to listen to. Jokes aside, my working definition is that steampunk music is any band or artist who draws musical inspiration from the past and innovates it and makes it their own in the present. The best examples of this are those who utilize older instrumentation blended with modern (such as banjos, accordions, and a brass band section to an otherwise rock band structure). Though those who simply borrow the visual aesthetic are also welcome, as each artist takes what they like of steampunk and adds their own efforts, which by it's very DIY nature is par for the course for steampunks everywhere. SP-M: When you're DJ-ing a steampunk event, what are some of the most requested songs? Do people overall stick within the steampunk theme, or do you get folks requesting modern music as well? As most of the time I play music folks have never heard of, I find I don't get too many requests. When I do, it's usually for songs out of my personal expertise. While I have no problems playing songs from Dr. Steel or older Abney Park, I've never been fond of the Goth-Industrial tunes, so I avoid them at my events and only work them in if the theme fits or if I get those odd requests. Happy to do so, but most of the time I get requests for gypsy punk tunes like Gogol Bordello, folk rock like Mumford & Sons or Beirut, or my usual speciality - electro swing. SP-M: Thank you for your time, and good luck with all of your upcoming adventures! What are the best sites and social media connections for keeping up with your events? You can follow me on FB at https://www.facebook.com/TheDoctorQ or The Artifice Club, which maintains most of the social calendar either via FB here https://www.facebook.com/ArtificeClub or the main site here http://www.theartificeclub.com/. Twitter handles to follow for Doctor Q, The Artifice Club, The Ratchet RetroCast, and the Alternate History Track if you're anti-facebook are, respectively - @DJDoctor_Q, @ArtificeClub, @RatchetRetroCas, and @DCon_AltHistory.